Sharing our ideas and know-how! Where to find the Le Parfait products? How to make your own preserves? How to make your own jams? How to open your preserves? 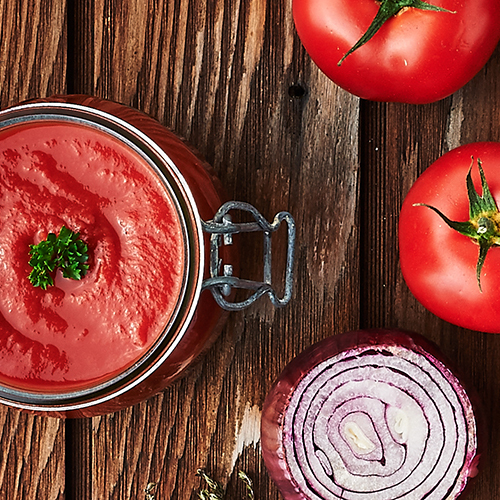 Set your sights on natural taste, and follow our detailed roadmap for perfect preserves! It’s so simple, you won’t need to refer to this page often (much to our regret). With the Le Parfait method, preserving is as easy as pie! Make sure the surfaces are not chipped or show signs of abrasion or residue. Clean the jars, terrines and lids with hot soapy water. Avoid any contact between the jars or the terrines. Do not use metal or abrasive sponges. 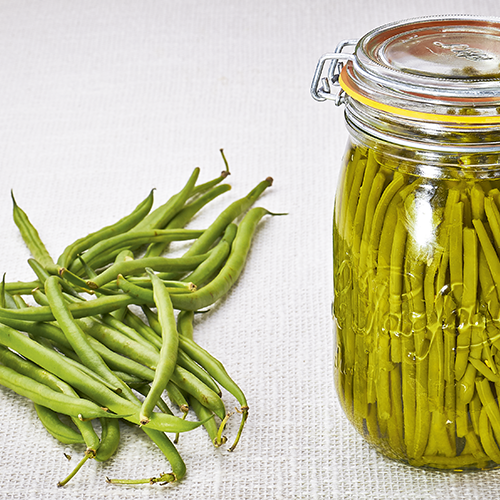 After cleaning, rinse thoroughly the jars and terrines with hot water and let air dry. When making preserves, always use perfectly fresh and healthy food, suitable for preserves. Never use frozen or defrosted products or ingredients. During the preparation, be careful not to mix peeled fruits or vegetables with the waste (peelings, leaves). If necessary, blanch the vegetables. Remove the entrails from the poultries and wash thoroughly the interior with water. Follow the recipe. All operations should be carried out without interruption and without wasting time. Fill the jars or terrines with the hottest preparation - even boiling. Fill the jars or terrines until the engraved mark, or up to 2cm from the brim. Wait a few minutes and check that the preparation is properly distributed, without air pockets. Be careful: do not use acid brines, sauces or liquids (pure alcohol, vinegar, etc.) in the Le Parfait Familia Wiss Terrines. Acid liquids may corrode the lid and sealing cap if they are in contact with metal parts. Before closing the jars and terrines, be sure to use a new Le Parfait Super rubber seal that fits the size of your jar or terrine. Scald the seal and position it properly on the jar or terrine. Check that the brim is clean before clamping. A particle trapped between the seal and the glass could spoil your preparation. Finally, clamp the closing system and proceed immediately to the heat treatment if mentioned in the recipe. The preservation processes differ according to the recipes – in some, the vinegar, oil or salt act as preservatives and a heat treatment is no longer necessary. Regarding the Le Parfait Familia Wiss Terrines, be sure to always use new Le Parfait Familia Wiss sealing caps specially designed to fit each terrine. The sealing caps should not be deformed and the seals should be in good condition. Screw on the lid (but don’t overtighten it) and proceed to the heat treatment. Put a clean cloth at the bottom of the pressure cooker to prevent any direct contact between glass and metal. Fill with hot water and put the cooker on the heat source. When the water starts boiling, immerse your jars/terrines. Be careful not to burn yourself. Place the jars or terrines upright, lids on top. Block them with other containers (full or if they’re empty, without covers). Add more water in the cooker: the jars/terrines should be completely immersed. Seal the pressure cooker hermetically. The time indicated in the recipe counts when the valve starts steaming. For the safety of your preserves, carefully respect the time indication. Once the time is over, remove the pressure cooker from the heat source. Cool naturally until all pressure is gone. Do not release the valve and, do not cool with water as the jars or terrines under pressure could open themselves with this quick cold cooling. Once cooled down, open the pressure cooker, take out the jars or terrines and store them upright in a cool dry place away from the light, with Le Parfait Super Jars’ clamp unfastened, and Le Parfait Familia Wiss Terrines’ lid unscrewed. Let the jars or terrines sit for a few hours until they are completely cooled, then check that each one is perfectly airtight by unfastening the clamp. The lid must stay sealed to the jar and resist to pressure. - Incorrect filling : too little or too much. - Unfinished heat treatment : not long enough and/or too low temperature. - Lack of air-tightness: chip or stain on the edge or the lid. - Old, used, deteriorated or inadequate rubber seal. To address this problem, repeat the heat treatment imperatively using a new rubber seal. Regarding Le Parfait Familia Wiss Terrines, please process identically then unscrew the lid. The sealing cap must stay sealed to the terrine and resist to pressure. If the sealing cap doesn’t stay airtight, repeat the heat treatment imperatively using a new sealing cap. 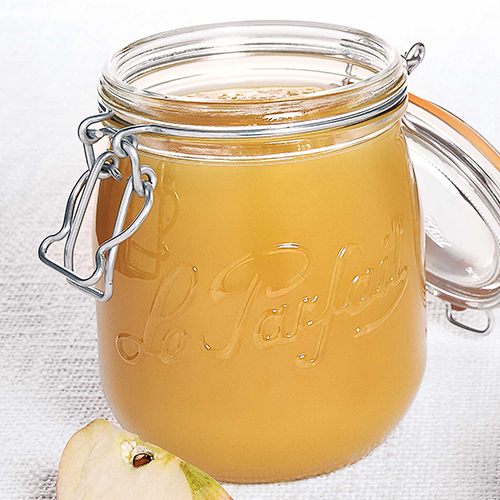 In order to keep your preserves several months, do not readjust the lids (Le Parfait Familia Wiss Terrines) or do not re-clamp the closing system (Le Parfait Super Jars or Terrines). Store in a cold dry place away from direct light. Before opening the jars or terrines, verify their airtightness (refer to Step 7). The jars or terrines must be opened by an adult. Pull the tab of the seal to let some air inside the Le Parfait Super Jar or Terrine. For an easier opening, we recommend that you use the Le Parfait opener which has been specially designed for this purpose. For the Le Parfait Familia Wiss Terrines, simply pierce the sealing cap. The perfect elixir of youth!